Owing to the high efficiency and reliability of our water and wastewater treatment equipment, we are approved and appreciated by our esteemed clients. The technology of membrane separation of activated sludge commonly referred to as “membrane bioreactor”, is a blend of activated sludge treatment together with a separation of biological sludge by micro or ultra-filtration membranes to create particle-free effluent. This system is a combination of biological processes and membrane technology to treat wastewater and to provide organic and suspended solids removal. The physical barricade enforced by membrane system provides total disinfection of the treated effluent. Membrane bioreactor system is becoming one of the flourishng technologies in wastewater treatment field. With several years of experience in this field, Effwa delivers advanced MBR solutions for your needs. Ultra-filtration (UF) is a low-pressure membrane filtration process used to remove suspended solids, colloids, and macromolecules from liquid streams. UF is the best pre-treatment technology for ensuring cost effective performance of the Reverse Osmosis (RO) System as it significantly increases the membrane life for the R.O membranes and reduces the cleaning frequencies, thereby reducing operating expense for the R.O System. Effwa offers fully automated modular membrane filtration systems having a long life and lower energy consumption. We offer central-driven and peripheral-driven, full bridge and half bridge mechanisms for clarifiers and clariflocculators of varied sizes, designed to achieve proper sludge scrapping without re- entrainment of the settled sludge. In case of clariflocculators, the mechanism also consists of flocculators in the flocculation zone suspended from the bridge. Employed as a secondary treatment step after clarification, Pressure sand filtration is a reliable and robust method for removal of suspended solids from water/ wastewater. We offer PSFs of size and material suited to the process requirement, with various media, distributor and underdrain configurations to achieve highest efficiency of filtration. Effwa’s PSFs are performing successfully in several water and wastewater treatment plants across the country. Effwa’s precisely designed ACFs find their application in water treatment for polishing of filtered water in order to remove odour, colour and taste by adsorption. They are also employed for wastewater treatment prior to reverse osmosis /demineralization as a measure against fouling of downstream process units. We offer ACFs of various sizes and materials designed based on the process requirement. Effwa’s resin columns for softening and demineralization are designed so as to be user-friendly, reliable and efficient. Our softening and DM plants employ high quality regenerable resins having a long life and are operating smoothly across various installations in India. Lamella clarifiers and tube settlers employ inclined plates and tubular structures respectively as settling surfaces. They are efficient solid-liquid gravity separators implemented for primary treatment of raw water, industrial effluent and sewage for removal of suspended solids. 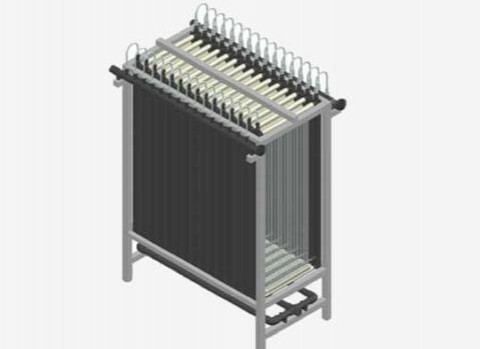 They make use of multiple inclined adjacent lamellar/tubular channels, combining to form an increased effective settling area and reducing the particle settling depth to a great extent as compared to conventional clarifiers. Effwa offers lamella clarifiers and tube settlers designed to have a considerably low installation footprint as compared to a conventional clarifier and they present a great advantage especially where floor space availability is a concern. Apart from executing large scale turnkey projects which involve major civil work, we also offer fully and partially automated containerized water and wastewater treatment plants as per Client’s requirement with appropriate treatment process designed based on the influent quality parameters. They are compact skid-mounted plants which can be transported easily from one place to another.